Memories of an English Spring – Chittaviveka & Amaravati visits May 2017. On the 30th of April 2017, a day after Ajahn V’s 70th birthday celebrations, Ven. Cunda and Ven. Khema accompanied by An. David, An. Siddarth and Noriko (lay guest) departed to spend ten days at Chittaviveka Monastery and attend Luang Por Sumedho’s open retreat followed by the international elders meeting at Amaravati. While the weary travelers trudged along, Fort Tisarana was steadfastly held by Ajahn V, Ven Khemako, An. Peter, Niraso (aka Brian) and the visiting bear. Ajahn Sucitto, Ajahn Karuniko and the Chithurst sangha were gracious hosts. The manor house, Hammer Pond, Hammer Woods, St. Mary’s Church (a blissfully secluded 10th Century Church near the monastery where Ajahn Sucitto would get away to memorise the Patimokha) and the national reserve forests were silent, peaceful and serene, offering much seclusion and calm. May is the best time to visit England and the English spring shines forth gloriously in West Sussex where the monastery is located. 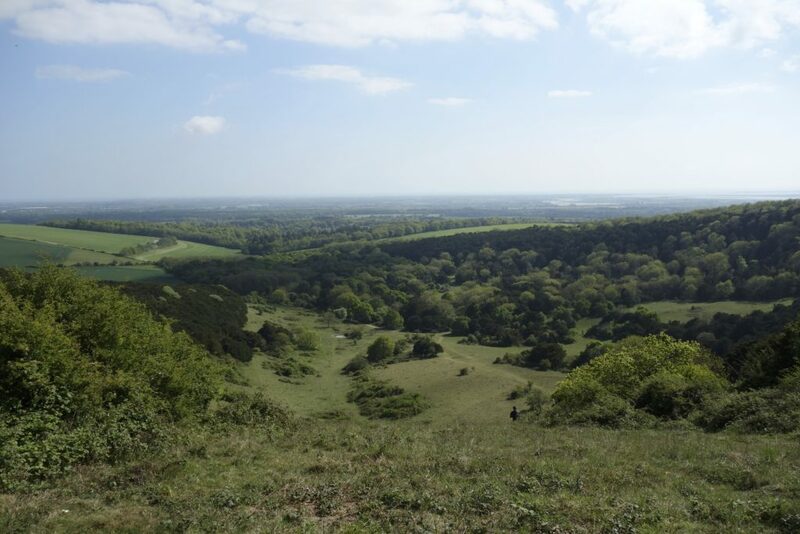 And indeed we were greeted by the darling buds of May – a sea of bluebells, lilies, an assortment of wild flowers and a truly resplendent dawn chorus thanks to the rich bird life in the area. Among the many attractions on the property were the bee hives which are kept by a local farmer who generously donates 1 in every 5 pots of honey harvested in lieu of rent! 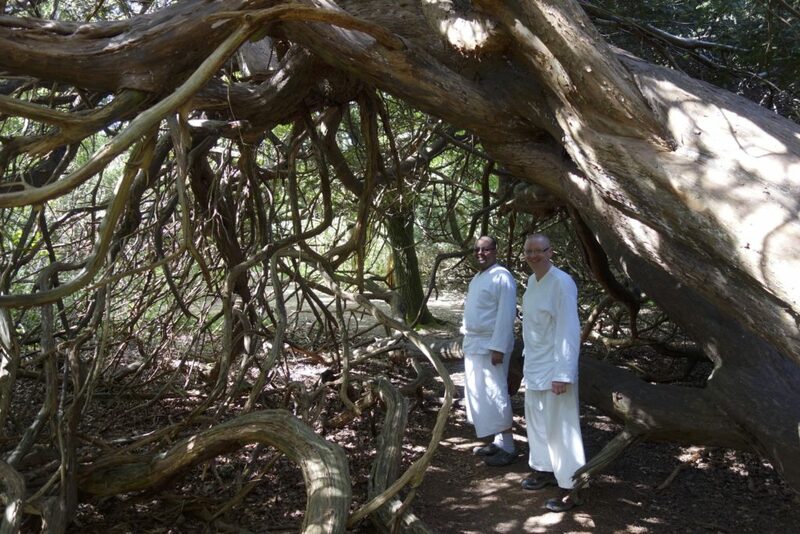 The grounds include a thousand year old yew tree that monks often sit around to practice funeral chants and many old oak, yew, hornbeam, beech and sweet chestnut trees that give shade to little Buddha Rupas and other images tucked away in their foliage. When the Temple sangha joined us, we visited the Kingley Vale Trail in South Downs National Park near Chichester to see the ‘oldest living yew trees in the UK & Europe’ and hiked up to some stone age burial mounds where we were treated to a panoramic view of Chichester Cathedral, Bogner Regis and the English Channel bordering the Coast of Brittany. We were then warmly welcomed to Amaravati by Ajahn Amaro and the Amaravati sangha to attend LP Sumedho’s week long open retreat. That in itself was a superlative experience with teachings, guided meditations, reflections, Q&As and Dhamma Talks given by LP Sumedho and most of the senior members of the Ajahn Chah Sangha supporting him. The highest count was 125 monastics and 375 lay retreatants on the last Sunday of the retreat. The week of silence and contemplation led in to the activity of the international elders meeting and Amaravati welcomed more senior ajahns, abbots and monastics for the flurry of meetings, discussions, contemplation, catching up with old friends and making new ones. 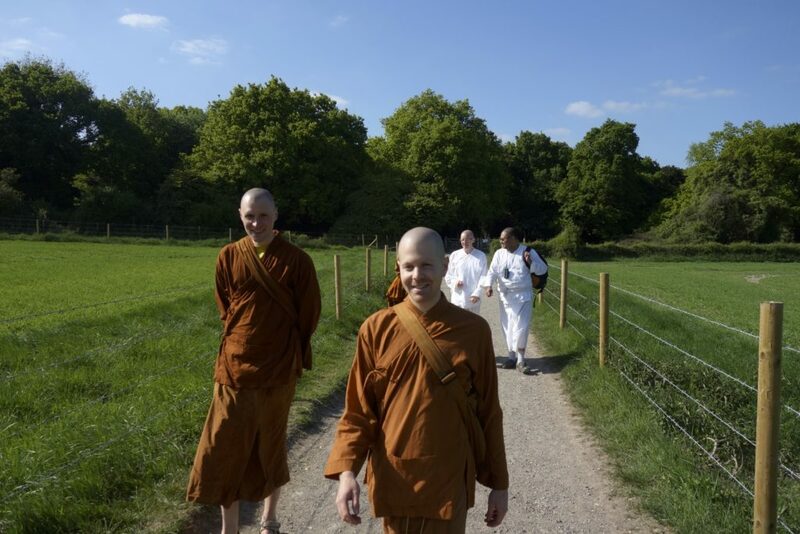 True community spirit that is the hallmark of Ajahn Chah’s teachings were exemplified by the conduct of the sangha. There was a sense of genial conviviality and gentle bonhomie that was quite palpable and raports were formed across all levels with LP Liem, LP Anek, LP Sumedho, LP Pasanno, Ajahn Sucitto and Ajahn Amaro at the helm. 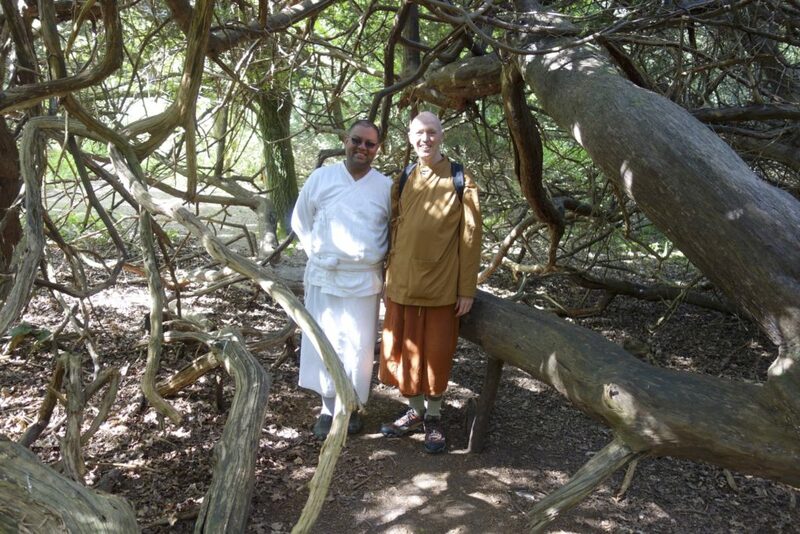 So, thank you Ajahn V for a wonderful month and an experience of a lifetime!